Arrival in Egypt, was greeted with excitement we had been at sea for five days so a day on land was needed. At 9 am we set off away from the town of Sharm El Sheik to Mas Mohammed, a nature reserve with pristine coral reef and great snorkelling. 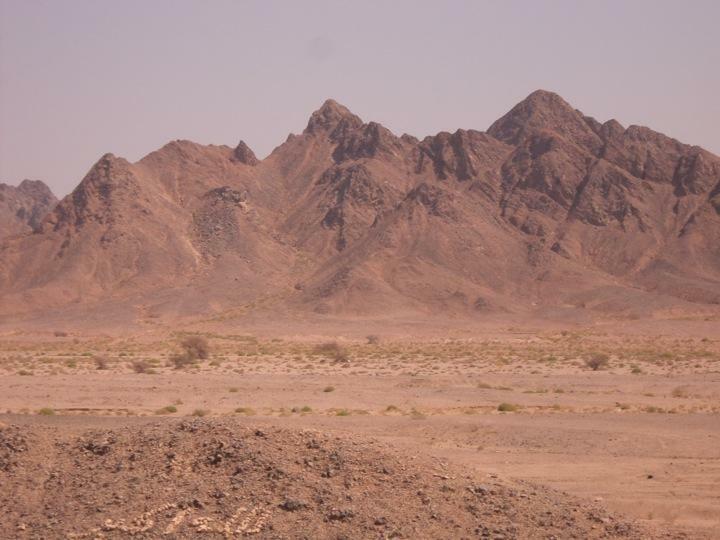 First impressions were that I didn't think the Sinai penninuslar had many mountains but that is exactly what there is there. It is really mountainous totally arid the only things that grow there are some herbs and Acacia trees, nothing else! There is a large Bedouin population and a healthy population of single hump camels. Not much else to be honest until about 20 years ago when they built Sharm El Sheik as a tourist centre. The snorkelling at Mas Mohammed was outstanding. You swam about 100m off shore and then the water dropped from 6 feet to about 100 feet this is where the reef was and there was an awesome display of both living coral and reef fish. Some of the fish were about 4 feet long (napoleon fish) and all the usual clown fish and large rainbow fish. The best snorkelling I have ever experienced as well as plenty of photo opportunities. Despite being only 20k from a large tourist centre this really did seem to be in the middle of nowhere and as good an example of desert as any i had seen in Dubai and Abu dhabi. This is a fascinating part of the world with Hugh history. There are clear signs of the recent war with Israel visible trenches and cordoned off mine fields that are still being cleared. There is a multi national UN military force present based at the perimeter of the town itself, I never knew about that. There are armed road blocks every few miles, it is really quite an edgy place. How and why they build towns in these places is difficult to understand, there is nothing here and the climate is such that you can only really live here November to April after this it becomes too hot to enjoy. Still we are grateful that it exists as it gave us both a brilliant opportunity to snorkel in the most exceptional environment. As the evening settled in you notice that ships appear in what you might call the beginning of a convey that assembles late every night for the transit of the suez canal. We also passed very close last night to an oil rig which was burning off gas very brightly from a long boom off it's side, it looked quite spectacular. As night fell the Red Sea had narrowed and you could clearly see lights from both the sinai (east) side and the Egyptian (west) side. Incidentally the east is in Asia and the west coast is in Africa.